Last week news broke on the Hollywood Reporter website of O’Keefe’s latest project, a sting operation designed to expose the corrupt and collaborative world of A-list Hollywood stars, producers, and Progressive NGO’s and non-profits like MoveOn.org that effectively make up a Hollywood environmental lobby. 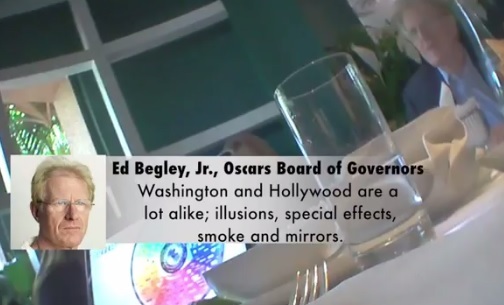 In this case, O’Keefe’s investigators offered this Hollywood environmental lobby millions of dollars from a fictional oil sheik to produce an anti-fracking movie. James’ tapes expose actors Ed Begley, Jr. and Mareil Hemingway as willing to lend their names and social media brands to the fictional project even though they knew the money was coming from Arab oil sheiks who’s goal was to keep America dependent on foreign oil. The man called “Mohammed” presented himself as the son of a Middle Eastern oil magnate, but he was an actor hired to embarrass two Hollywood celebrities. He secretly recorded Mariel Hemingway and Ed Begley Jr. at a lunch meeting at the Beverly Hills Hotel. They were there to support a friend making a documentary about the dangers of fracking, a controversial mining technique used to extract natural gas. The purported oilman was working for James O’Keefe, the conservative activist with a track record of using deception and hidden cameras to discredit liberal targets. The sting was similar to one staged by O’Keefe against National Public Radio in 2011, which led to the resignation of its CEO, after a top executive was surreptitiously recorded in a meeting with two men posing as potential donors from a Muslim Brotherhood front group. The difference in this case is that Hemingway and Begley were not looking to raise a dime and have no stake in the proposed fracking documentary. They were there at the request of director Josh Tickell, a liberal filmmaker whose past work has focused on biofuels and the BP oil spill. 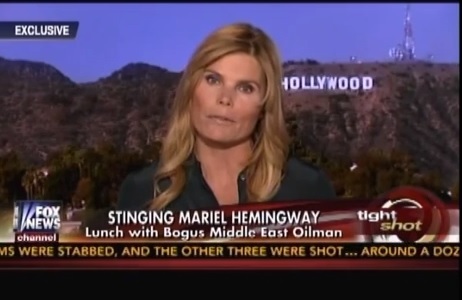 Yesterday, Mariel Hemingway told Howard Kurtz that she knew she attended the luncheon to help a friend get money for an anti-fracking film project from a Middle East donor. Hemingway also admitted they waited an hour-and-a-half for the Middle East funder to show up to the meeting. Kurtz gave Mariel Hemingway roughly ten minutes to tell her side of the story. But, James O’Keefe told The Gateway Pundit today Kurtz did not give him a chance to tell his side of the story. James O’Keefe was not invited on the show.